What Are The Eight Steps Of Raja Yoga? Which mean by suppressing the modifications of the mind-stuff or restraining the thought-waves, a man obtains Yoga. Today every man is suffering from despair, sadness, and frustration. The man himself is responsible for the pitiable state that he is in. All his efforts are aimed to achieve material success and see the irony that the same material prosperity has brought along with it frustrations, despair, mental tensions and lot of diseases. Many years ago, Sage Kapila formulated the system of Samkhya yoga, to bring happiness to the neurotic and the confused. Sage Patanjali later modified Kapila’s philosophy and his Yoga Sutras define yoga as the science of mental control, and of control over all patterns of personality and behavior. Though the present time is different from that time, nothing much has changed in man’s thinking. He needs treatment of his thinking or in a broader prospect, his mind. And meditation is the best answer to all his despair. Meditation is that technique in Yoga, through which we are able to view our problems in proper perspective. Through this technique, we are able to realize that our disappointments, our unhappiness, and other problems are internal, self-made. Through meditation, we learn to discover our inner self, to achieve inner harmony. Sage Patanjali has put meditation as that state of mind “when it becomes free from the awareness of subjective and objective experience”. This is the highest state of meditation and is meant for the spiritual aspirant. 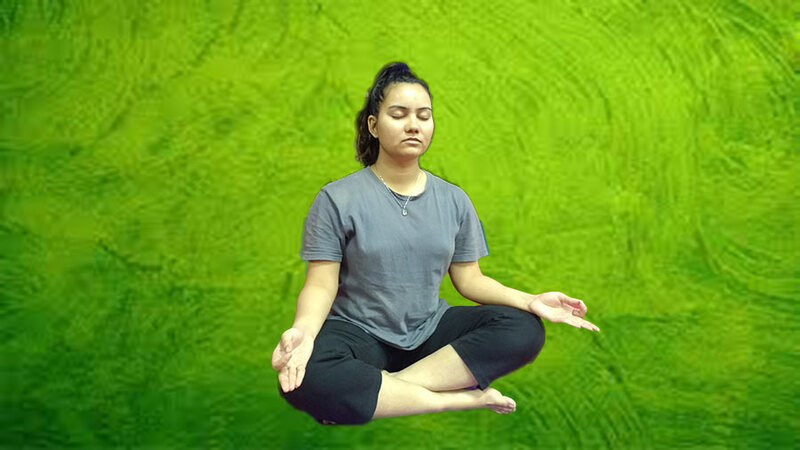 But in the present format, where it is used as a technique of relaxation and also in therapeutic applications, several techniques of meditation are used for the purpose. Hatha Yoga – so that the body can be strengthened. Bhakti yoga – Practicing Bhakti Yoga, especially by chanting mantras and singing kirtan in the praise of Lord, the stability of mind can be achieved. These steps form the base of meditation. The best time to practice meditation is either during early morning (morning meditation) hours or at the time when the sun is setting. In the morning, the body is stiff because of the deep rest and continuous sleep during the night. In the evening or at night, when we come after doing the day’s work, the body and mind are strained. In such conditions, the flow of Pranas is blocked. To remove this blockage, some asanas and pranayama are recommended. The practice of these three asanas can help regulate the supply of the Pranas throughout the body. Tadasana opens up joints and stretches each part of the body. Tiryak Tadasana contract one side of the body, and at the same time stretches the other side. This result in proper blood circulation in both the sides of the body. Kati Chakrasana squeezes the body in general, removing the obstructions in the supply of pure blood throughout the body. Kapalbhati sharpens the brain and removes lethargy from the mind. The imbalance of the nervous system is the biggest obstacle in the practice of meditation, and by removing this obstacle by Nadi Shodhana pranayama, a balance is brought in the nervous system. Bhramari Pranayama gives relaxation to the body, brain, senses and nervous system. It makes the mind introverted. The three pranayama increases concentration and brings peace to the mind. After control over the restlessness of body and mind has been achieved by the above practice, next step should be to separate and isolate the mind from the external disturbances. Here Pratyahara comes into the picture. Pratyahara is the withdrawal of the senses. It is the technique that will help isolate the mind from the external world. It tackles the problems of stress right at the very sense organs which are the source of external disturbances. It is through the sense organs that our mind is bombarded with a continuous flow of ‘data’ from the outside world. Kayasthairyam is one such practice of Pratyahara. Kayasthairyam means physical stability and is one of the preparatory practices of Meditation. Sit in any meditation posture, preferably Padmasana or Ardh-Padmasana or even Sukhasana. Become aware of the external environment. Become aware of all the surrounding sounds one by one, without getting involved in any of them. Maintain a detached awareness while doing so. Become aware of the entire body, all parts of the body in a sequential manner. If any part of the body moves, may be for any reason, simply become aware of it. The attitude should be that I am fully aware of my body. Even if some part of my body moves, I am fully aware of this fact too. After some time, the movement stops. The consciousness enters deep into the body. It becomes aware of every subtle process taking place inside the body e.g. blood circulation, heartbeats, vibration in the nerves etc. So, first by becoming aware of the external environment, the obstructions of the external environment are removed and then by becoming aware of the physical and subtle processes of the body, the obstruction of these processes is removed. Once a Practitioner of Meditation has mastered the Pratyahara, then the doors of Dharana will open, which will further lead him to Meditation. How to practice Dharana and how to do Mantra Meditation has been explained in part – 3 of the Meditation series. – Meditation – Part 3 – What Is Dharana And How To Do Mantra Meditation for it.